The mother of a newborn girl whose apprehension into care was streamed live on Facebook has a long history with the child welfare system, including being investigated twice for child abuse, court records say. The Winnipeg mother of a newborn girl, whose apprehension by child protection workers was streamed live on Facebook, has a long history with the child welfare system, including being investigated twice for child abuse, court records say. The mother's Child and Family Services (CFS) file, which was presented as part of child protection hearings in court that continued Wednesday, says her first child was apprehended in 2014. That child would have been in her late teens. The file says the child was apprehended due to crack and alcohol use, neglect, the mother's mental health issues and inappropriate parenting. The mother's second child was just two days old when she was taken by child protection workers, escorted by members of Winnipeg police, last month at St. Boniface Hospital. A child protection hearing for the case, which began last month, occurred Wednesday. There, lawyers said the father of the baby has been identified, and his legal counsel needed more time to review the matter. At a hearing two weeks ago, a lawyer involved in the case said they were still working to find out who the father was. The mother's file says she had previously thought the father could be one of two men, but the man she believed was more likely the father was a "bad guy" who was verbally abusive and is currently incarcerated. The mother's lawyer said she couldn't comment Wednesday. The father's lawyer also declined to comment. An extended family member filmed the emotional apprehension of the infant and streamed it live on Facebook. The video was watched and shared over 28,000 times. In the video, the mother can be seen sobbing while rocking her newborn back and forth before CFS workers take the child away. A news conference was organized by the First Nations family advocate office at the Assembly of Manitoba Chiefs the morning after the video went viral. There, the mother spoke to media while flanked by family members and First Nations leaders. After wiping tears from her face, she said she was "blindsided" when her newborn was taken away, because she had made arrangements to have her aunt take guardianship of her baby. CBC News has also reached out to the First Nations family advocate office, but has not received a response. An affidavit from a Winnipeg CFS worker says the newborn was apprehended because of substance use and mental health issues. Her CFS file says she used alcohol, cocaine and OxyContin while pregnant. She tested positive for OxyContin in late December, less than a month before she gave birth. She also told a worker from the Child and Family All Nations Coordinated Response Network that she is an alcoholic in November 2018, the file says. Court documents say emergency medical service workers and hospital staff said she smelled of alcohol when she arrived at the hospital to give birth. The mother's family denied this, saying she was in pain from childbirth. After the birth, hospital staff said she seemed "overwhelmed by the requirements of parenting" and was asking for morphine. Hospital staff also said she wasn't picking up on hunger cues from her baby, and staff had to bottle feed the newborn, court documents say. CFS workers did do a background check on the family member the mother said she wanted to care for the baby after birth, but it produced "concerning results" and further work was needed to gather more information, the documents say. The mother's file says concerns about past and current substance use, mental health issues including ADHD, anxiety and depression, safety concerns regarding the father, and previous history with poor parenting led CFS to deem the newborn to be a child in need of protection. 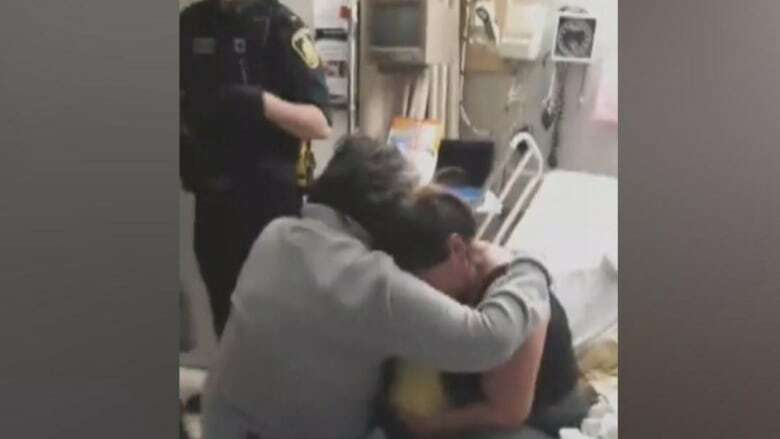 The video of the newborn's apprehension sparked a massive public reaction when it was put online in mid-January, with many calling for changes to the child welfare system in Manitoba. The case was transferred to Island Lake First Nation Family Services on Jan. 14. Cathy Rocke, the associate dean of the University of Manitoba's faculty of social work, said the video only shows a point in time, when the full picture of the case is much more complicated. "It's very traumatic to have a child removed in the hospital from the arms of their mother, of course, but it's the back story that, if people understood, I think that the narrative would be different," she said. "If the mom is seen as having ongoing addiction issues, that there's been issues that have been long-standing, that gives people a little bit more pause." Rocke, who spent many years working in child welfare, said when doing background checks on family members, CFS workers look for any evidence of abuse and criminal charges that involve violence. "Those are the two main things. We need to check it out," she said, because "if they place a child with somebody and that child gets hurt, then they haven't been shown to do their due diligence."